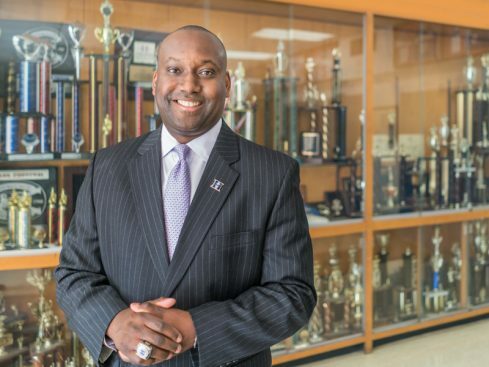 Almost 20 years later, Starks serves as associate head of school, director of athletics, basketball coach and executive vice president of Harding Academy in Memphis, Tennessee. While “minister” is not officially part of his title, ministry is at the heart of his career. His pulpit is his office, the basketball court and the hallways of the school he once walked as a student. “I’m actually getting to do what I think God has put on my heart to do,” Starks said. He and his teams are no strangers to winning. The Lions have captured a state title three times in five tournament appearances, and Starks has multiple state and national awards as Coach of the Year and been named the top A.D. in his district. But to Starks, basketball victories start long before the end-of-game buzzer. Coaching a team to a win requires a solid relationship with players, as well as the realization on each teammate’s part of playing for something much bigger than themselves. When Starks wore a Lions basketball uniform at Harding Academy, he was new to his faith. He started at the school in seventh grade, and his family had not attended church much. Religion classes are required every year at Harding, and by the time Starks graduated, Bible was his favorite subject. He never dreamed he would go far away for college, but ACU offered him a basketball scholarship, and before he knew it, he was making the long trek from Memphis to West Texas. Starks lettered four times at ACU, and a couple of years after graduating found himself doing something else he never envisioned: returning home to Tennessee to coach at his high school alma mater where he met his wife Becky, who is now the head girls’ basketball coach. The couple goes to work together every day, and has two children: Kellen and Skylar. Starks is still close friends with teammates from his years at ACU.